Happy Anniversary, Mr. & Mrs. Owyang! Jeremiah and Shirley Owyang are about to celebrate their first anniversary at Lake Tahoe and I wasn't even invited to join them. The nerve. Congrats guys. It's been a pleasure getting to know you this year. You have both always felt like you have been married forever. This photo from Techcrunch 7 was taken by Scott Beale/Laughing Squid. 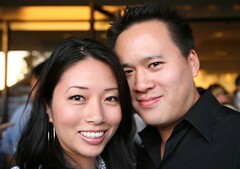 Speaking ofTechcrunch, Jeremiah has posted a great sample Scrapblog page of the Techcrunch Party.